Although our giving page is no longer active, you can still donate. We are currently running another campaign for this next month. To help us reach our goal, please click here. We are the Ohio State University chapter of a national organization called Engineers Without Borders. The organization is a collection of chapters across the country who use engineering principles to empower communities to meet basic human needs. We are currently working on an agriculture improvement project with the village Njau located in the West African country of Gambia. The community is heavily reliant on their fields for food and supplemental income. However, their unreliable water system often causes them to go days without available water to drink or irrigate crops. We need your help in order to implement the new solar-powered water system and other improvements which we have been designing over the past 2 years. Your contribution will help us purchase materials and hire local labor in order to make the changes a reality. Engineers Without Borders is dedicated to forming long-term relationships with communities in need in order to create lasting solutions. Our chapter has roughly 40 student members from a variety of engineering disciplines and related fields. We are united by the desire to apply what we learn in the classroom to make a difference in the lives of others. Through your donation, you will be promoting sustainable change for a community in desperate need. In addition, your generosity will allow our student members to gain the invaluable experience of managing and executing a real world engineering project as students. Our organization and the community of Njau are extremely grateful for your support. If you would like any additional information, feel free to reach out to any of the project leaders listed in the top right corner of the page. To learn more about our club, please visit our website or our Facebook page. 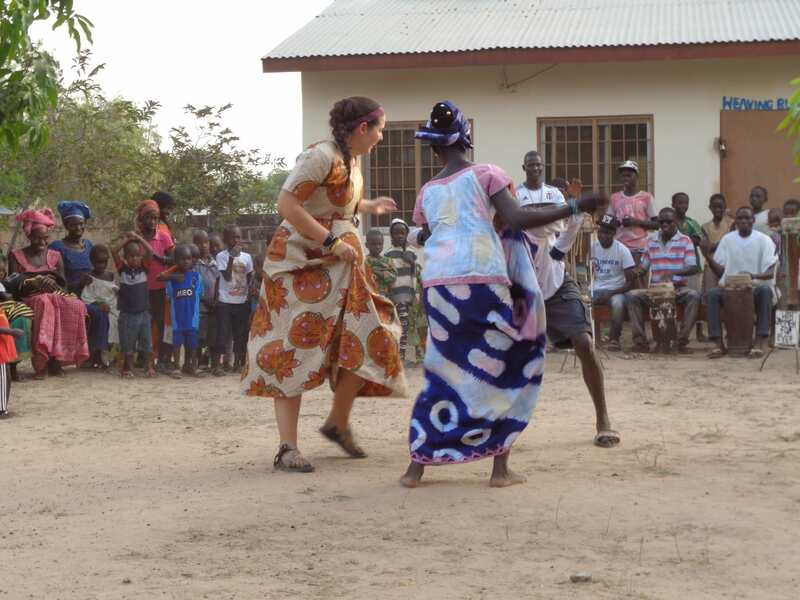 Emily Aebker, the International Project Lead, strengthened her relationship with the community by joining in their dancing. Sending the 6 students on each trip to have a life changing experience. Improve the lives of the people living at 13 degrees North and 15 degrees West. Help to renovate the 23 water sources in the community including water taps, wells, and hand pumps. The average life expectancy in the Gambia is 53 years. In the heat of the dry season, temperatures can reach up to 120 degrees Fahrenheit. The dry season in Njau lasts roughly 240 days. Provide a richer quality of life for the 2000 people who live in Njau.